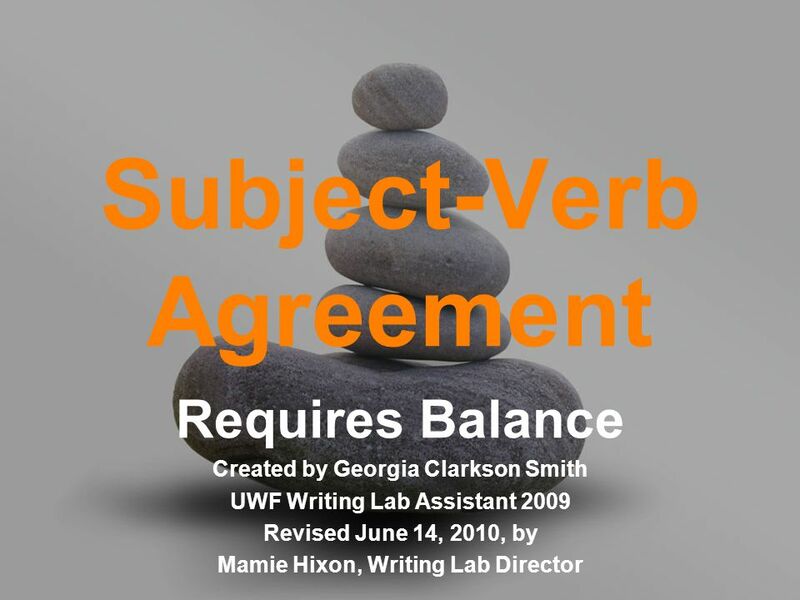 Subject-Verb Agreement Requires Balance Created by Georgia Clarkson Smith UWF Writing Lab Assistant 2009 Revised June 14, 2010, by Mamie Hixon, Writing. 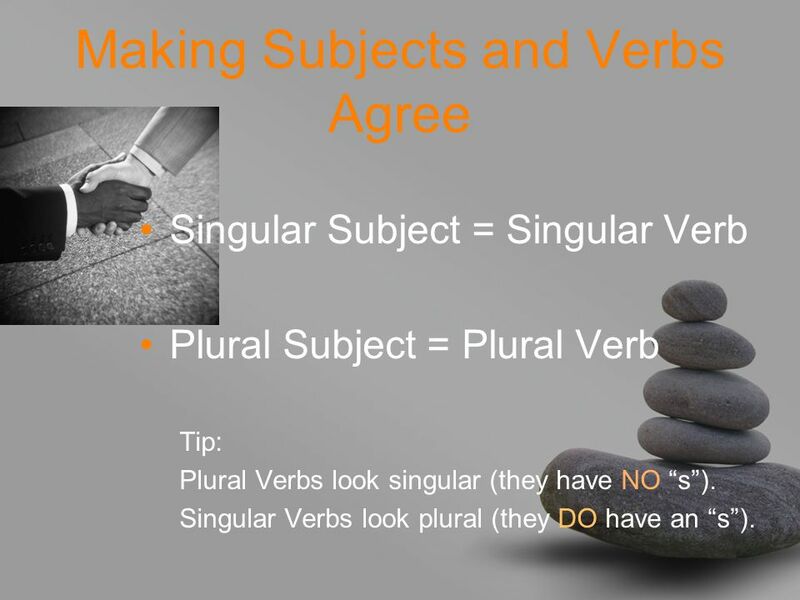 2 Making Subjects and Verbs Agree Singular Subject = Singular Verb Plural Subject = Plural Verb Tip: Plural Verbs look singular (they have NO “s”). 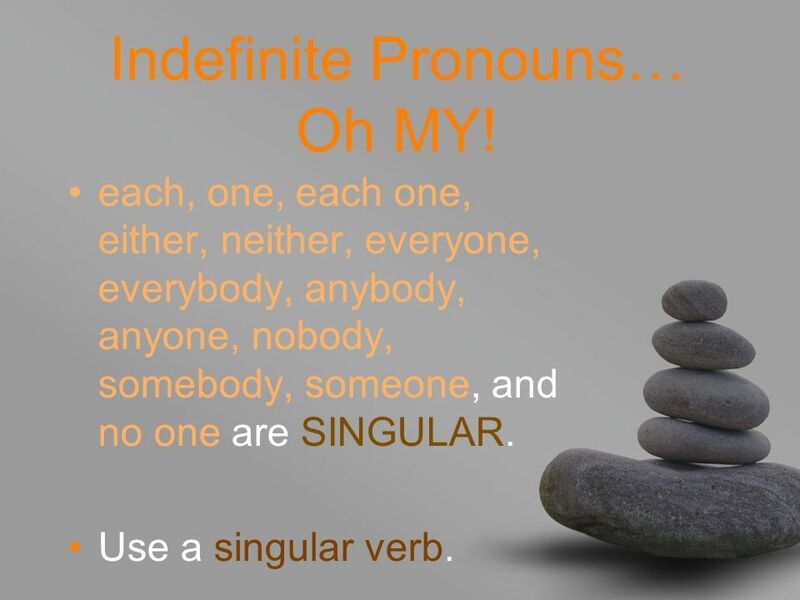 Singular Verbs look plural (they DO have an “s”). 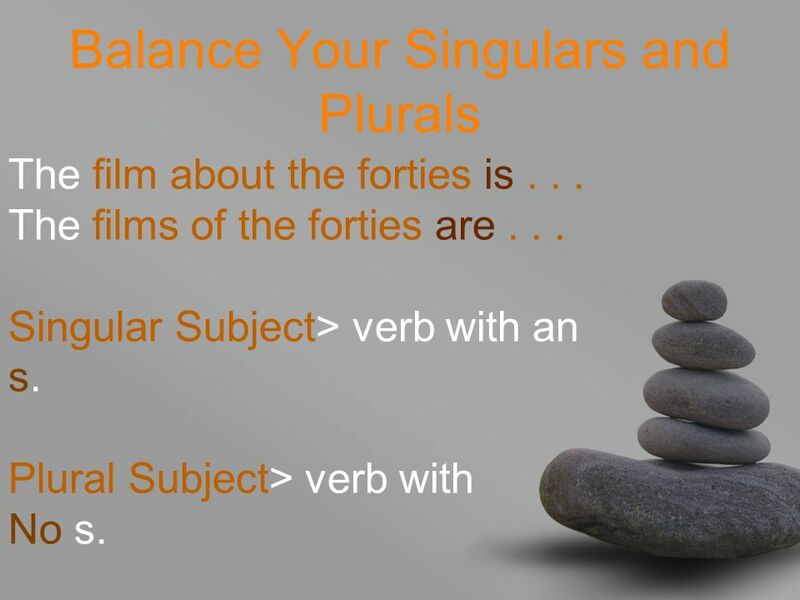 3 Balance Your Singulars and Plurals The film about the forties is... The films of the forties are... Singular Subject> verb with an s. Plural Subject> verb with No s.
4 Balanced Sentences “This presentation is boring”…Singular subject = Singular Verb “Perhaps, not all of the presentations are boring”…Plural Subject = Plural Verb Sounds Easy… Right? 8 “AND” When several subjects are connected by AND, use a PLURAL verb. The complaints and questions are frustrating. 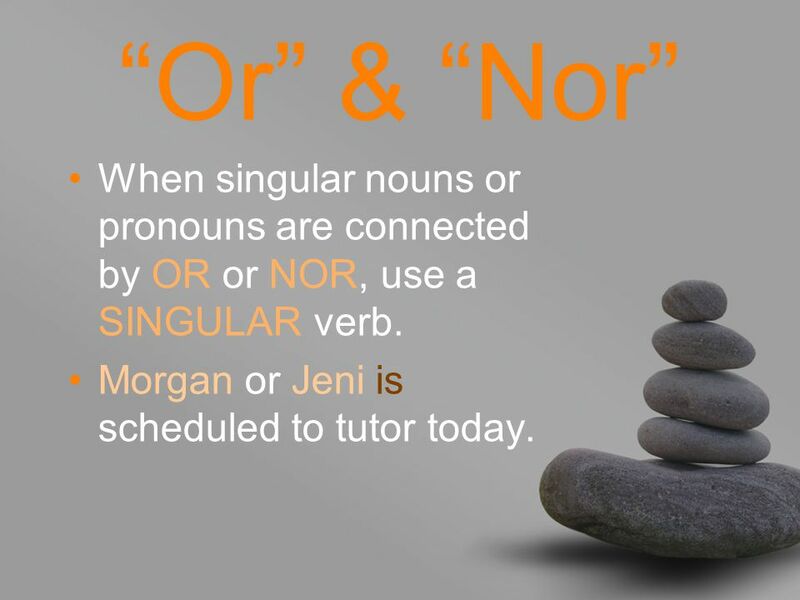 9 “Or” & “Nor” When singular nouns or pronouns are connected by OR or NOR, use a SINGULAR verb. Morgan or Jeni is scheduled to tutor today. 10 “Either... Or” and “Neither... Nor” When singular nouns or pronouns are connected by EITHER…OR or NEITHER…NOR, use a SINGULAR verb. Neither the airline nor the flight attendant is happy. 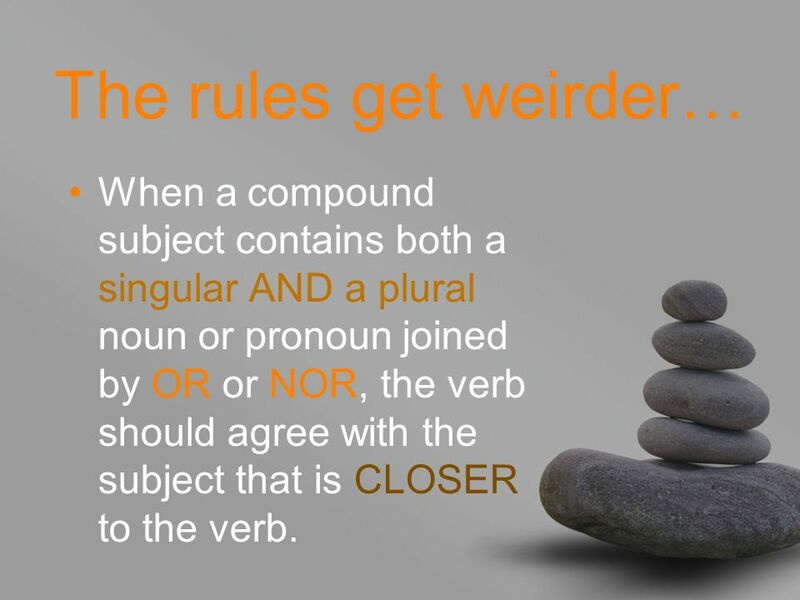 11 The rules get weirder… When a compound subject contains both a singular AND a plural noun or pronoun joined by OR or NOR, the verb should agree with the subject that is CLOSER to the verb. 12 The host or her guests are expected to leave the tip. The guests or the host is expected to leave the tip. 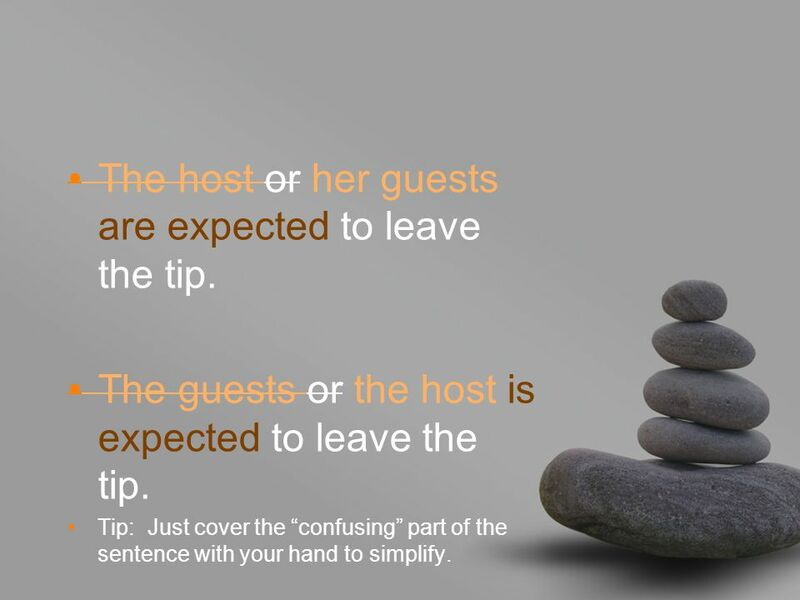 Tip: Just cover the “confusing” part of the sentence with your hand to simplify. 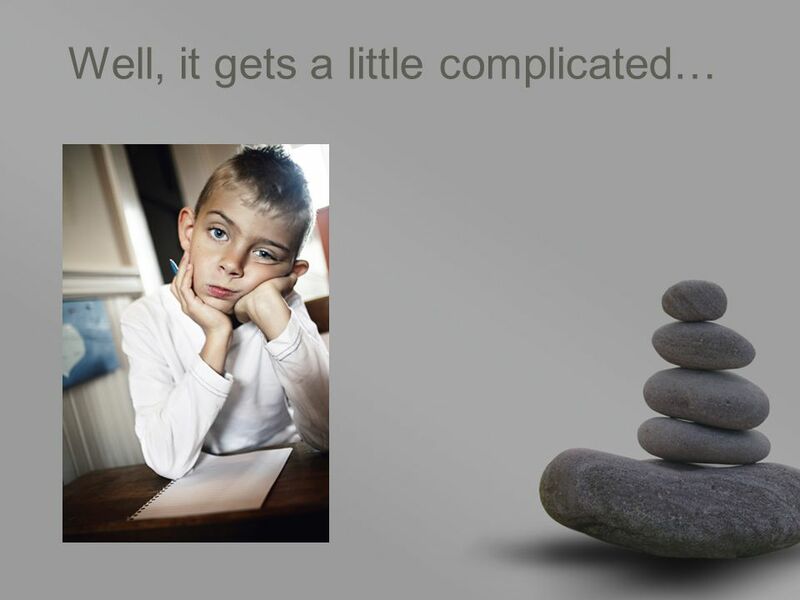 13 “Doesn’t” & “Don’t” Doesn’t = Does not….this is a singular verb form. 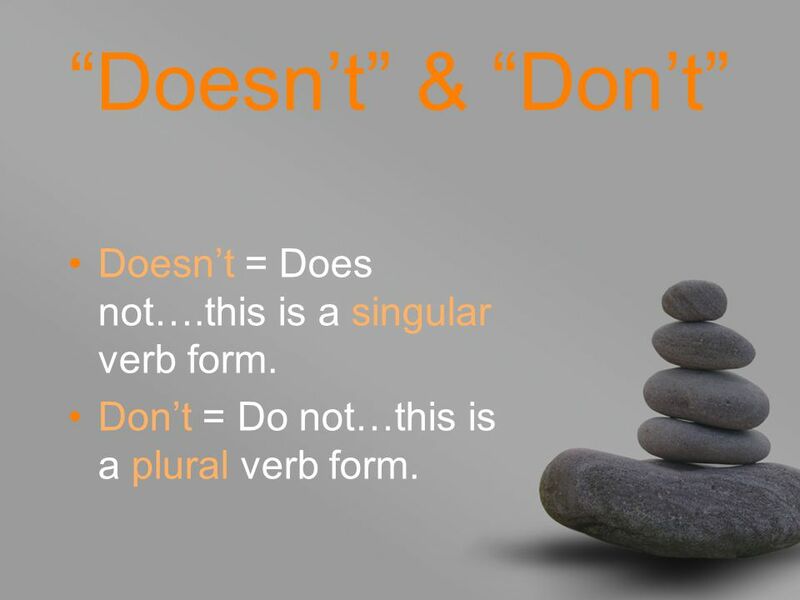 Don’t = Do not…this is a plural verb form. 14 The employee does not (doesn’t) agree with the decision. The employees do not (don’t) agree with the decision. Tip: Remember that though your verb phrase is “do like” OR “does like,” make your subject agree with the first verb in the phrase: “do” OR “does.” This helping verb is where we add or remove the “s” for balance. 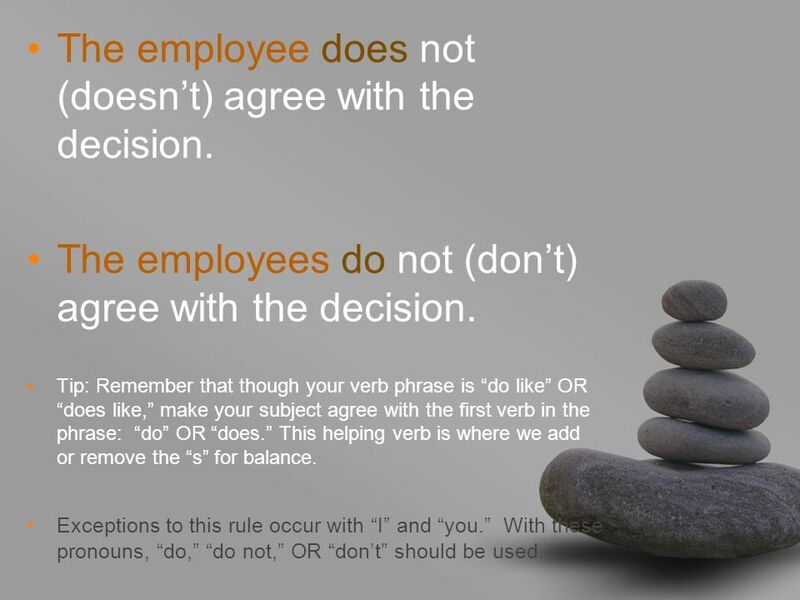 Exceptions to this rule occur with “I” and “you.” With these pronouns, “do,” “do not,” OR “don’t” should be used. 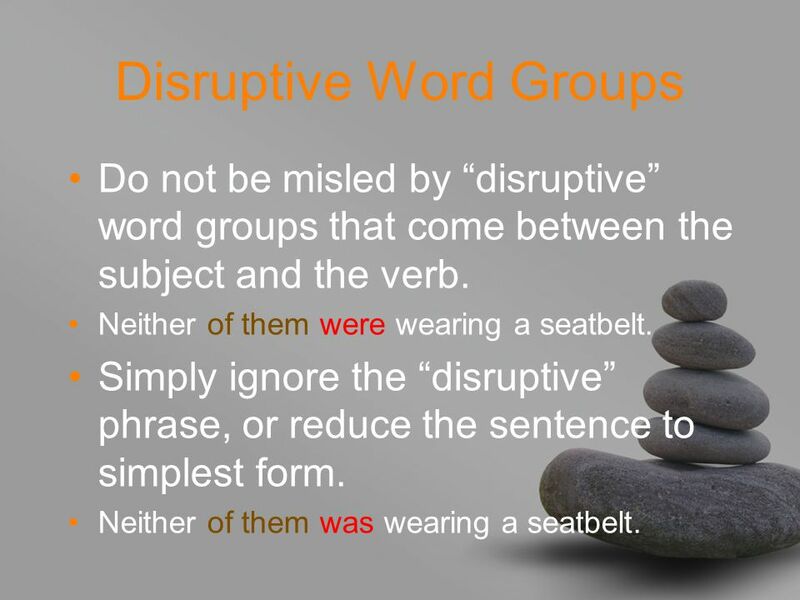 16 Disruptive Word Groups Do not be misled by “disruptive” word groups that come between the subject and the verb. Neither of them were wearing a seatbelt. Simply ignore the “disruptive” phrase, or reduce the sentence to simplest form. Neither of them was wearing a seatbelt. 17 The people who listen to that music are few. The team captain, as well as his players, is anxious. The book, including all the chapters in the first section, is boring. Every resident in three counties was affected by the storm. 18 Indefinite Pronouns… Oh MY! each, one, each one, either, neither, everyone, everybody, anybody, anyone, nobody, somebody, someone, and no one are SINGULAR. Use a singular verb. 19 Each of these students is receiving a trophy. Everybody loves a winner. Neither of the teams has ever won a championship game. Either answer is correct. Someone appreciates your efforts. 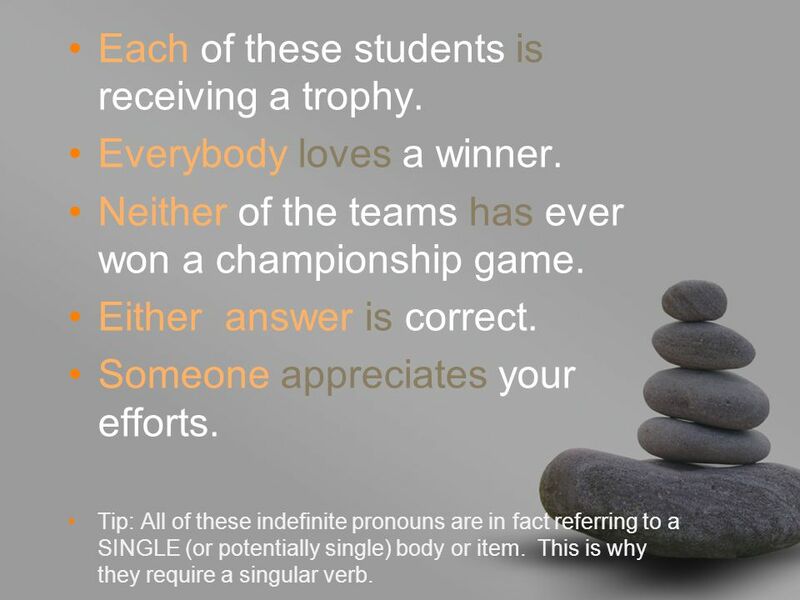 Tip: All of these indefinite pronouns are in fact referring to a SINGLE (or potentially single) body or item. This is why they require a singular verb. 20 Nouns like civics, economics, AIDS, and news require singular verbs though the nouns themselves end in “s” and look plural. The news is on at six. Home economics involves more than sewing and cooking. AIDS is an epidemic. Tip: These words imply a unified group, body or collection of information or study…this is why they are singular. 21 DOLLARS $$$ When referring to an amount of money, use a singular verb. 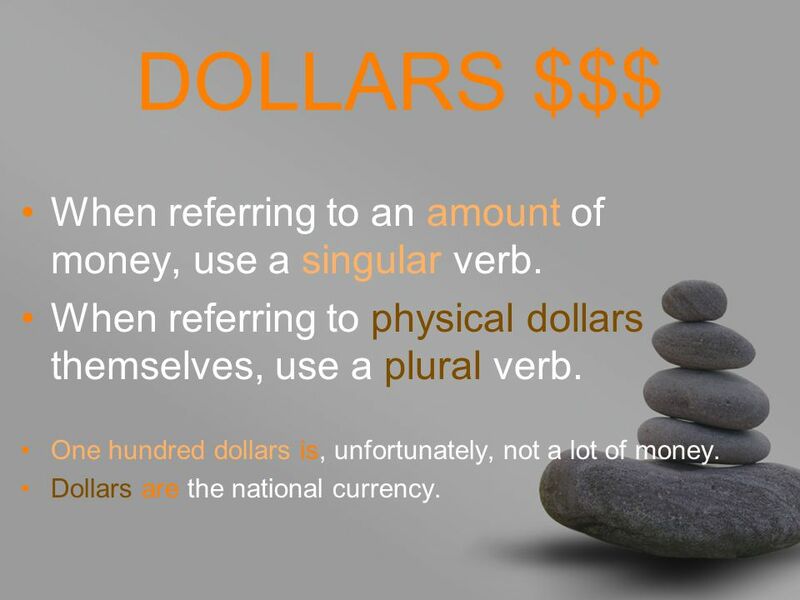 When referring to physical dollars themselves, use a plural verb. One hundred dollars is, unfortunately, not a lot of money. Dollars are the national currency. 22 Time, Distance & Weight. -Twenty miles is quite a distance to run daily. -Kilometers are a part of the metric system. -Five hundred pounds is heavy. 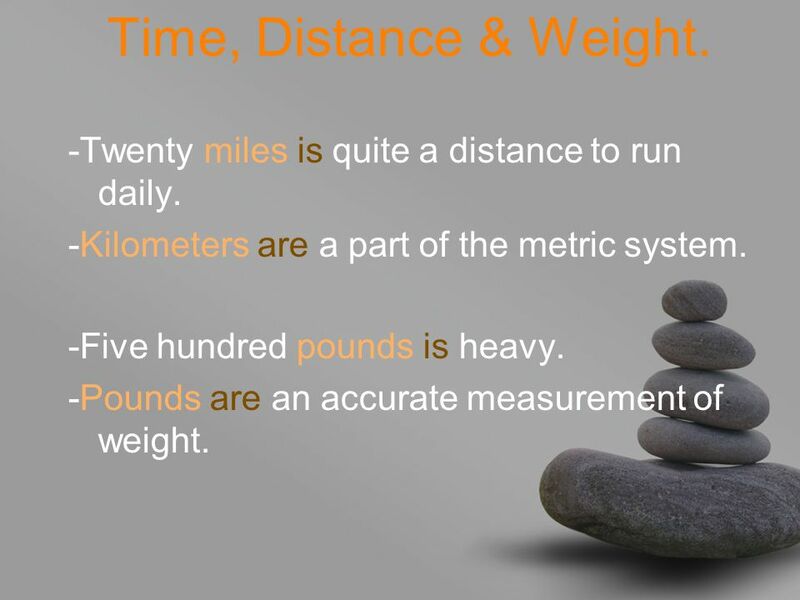 -Pounds are an accurate measurement of weight. 23 Things With 2 Parts Like scissors, pants, eye glasses, tweezers… Plural Verbs. The safety scissors are ironically razor sharp. Her pants are outrageously tight. 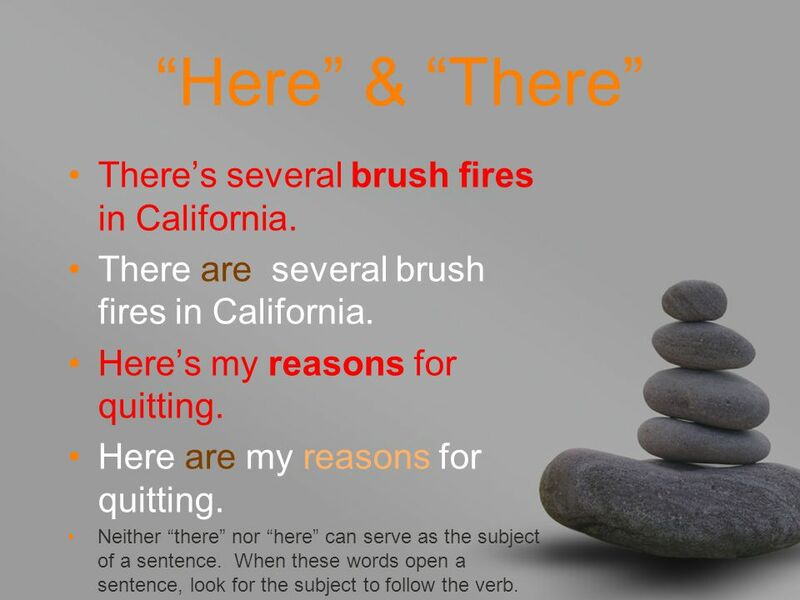 24 “Here” & “There” There’s several brush fires in California. There are several brush fires in California. Here’s my reasons for quitting. Here are my reasons for quitting. Neither “there” nor “here” can serve as the subject of a sentence. 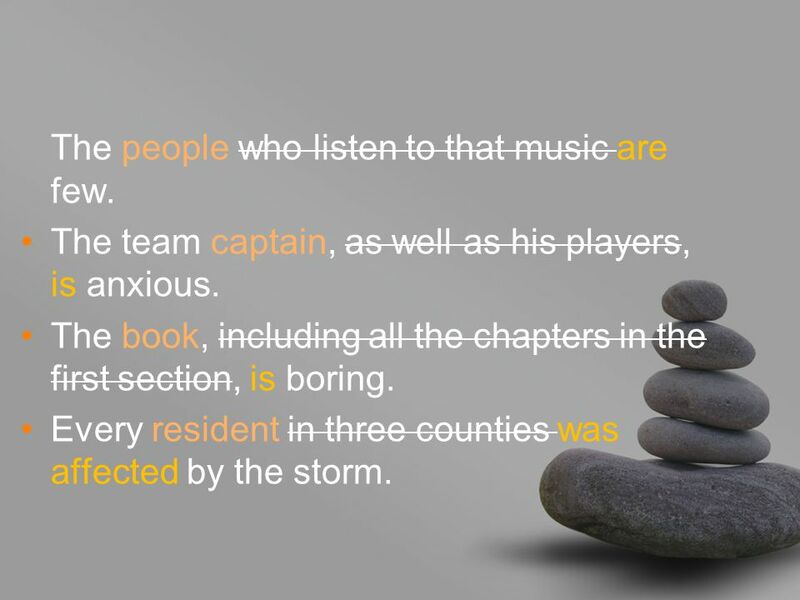 When these words open a sentence, look for the subject to follow the verb. 26 If the persons in this collective noun are working together, or are being referred to as a whole, they take a singular verb. The team runs during practice. My family goes to church. 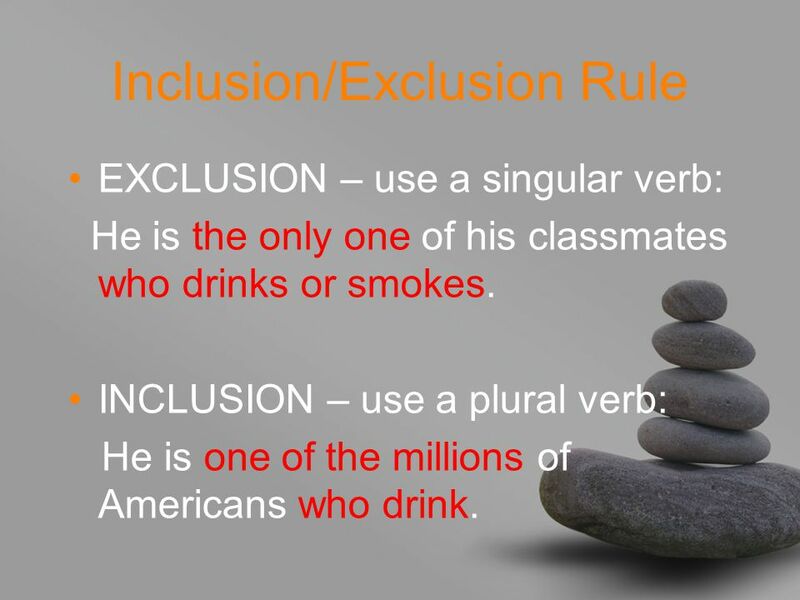 30 Inclusion/Exclusion Rule EXCLUSION – use a singular verb: He is the only one of his classmates who drinks or smokes. INCLUSION – use a plural verb: He is one of the millions of Americans who drink. 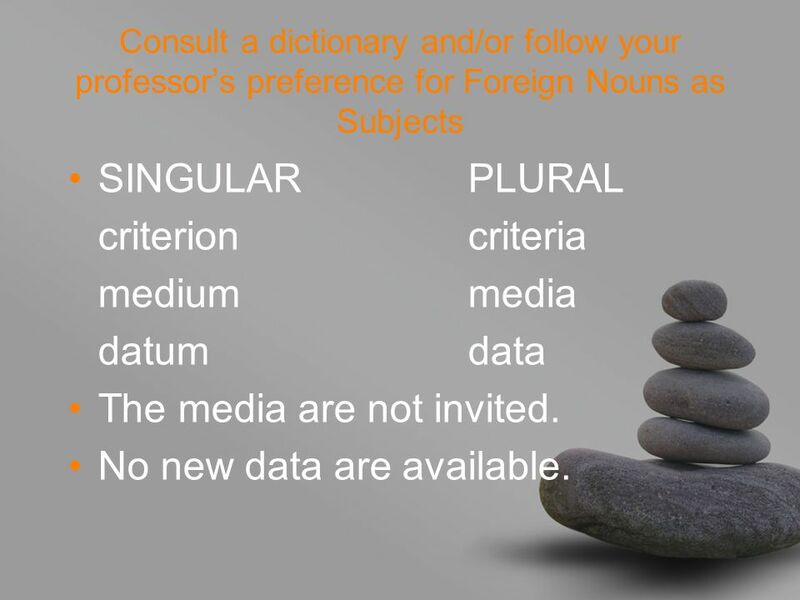 31 Consult a dictionary and/or follow your professor’s preference for Foreign Nouns as Subjects SINGULAR PLURAL criterioncriteria mediummedia datumdata The media are not invited. No new data are available. 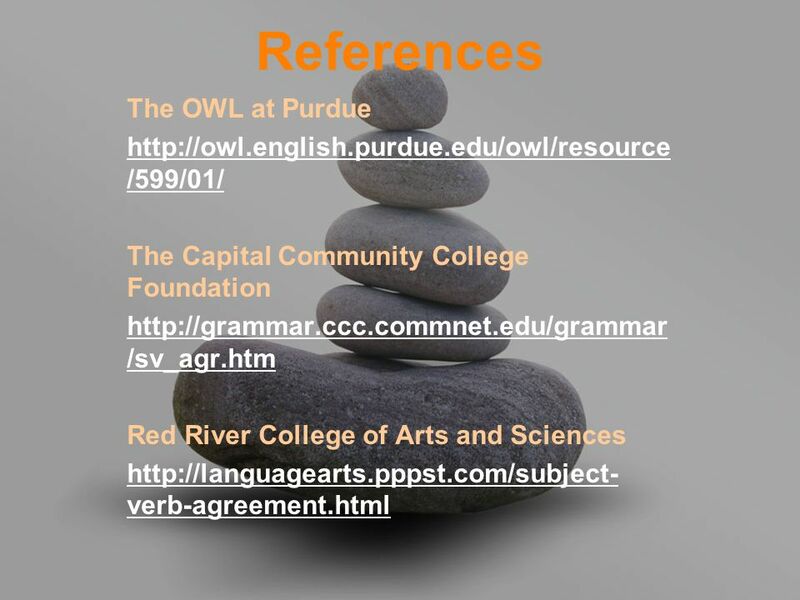 Download ppt "Subject-Verb Agreement Requires Balance Created by Georgia Clarkson Smith UWF Writing Lab Assistant 2009 Revised June 14, 2010, by Mamie Hixon, Writing." Shifts in Number and Person NEC FACET Center. PART 1 Shifts in Person. Pasco-Hernando Community College Tutorial Series. It all builds on one little sheet of paper… sentence basics. A verb must agree with its subject in number (singular/plural) and person. 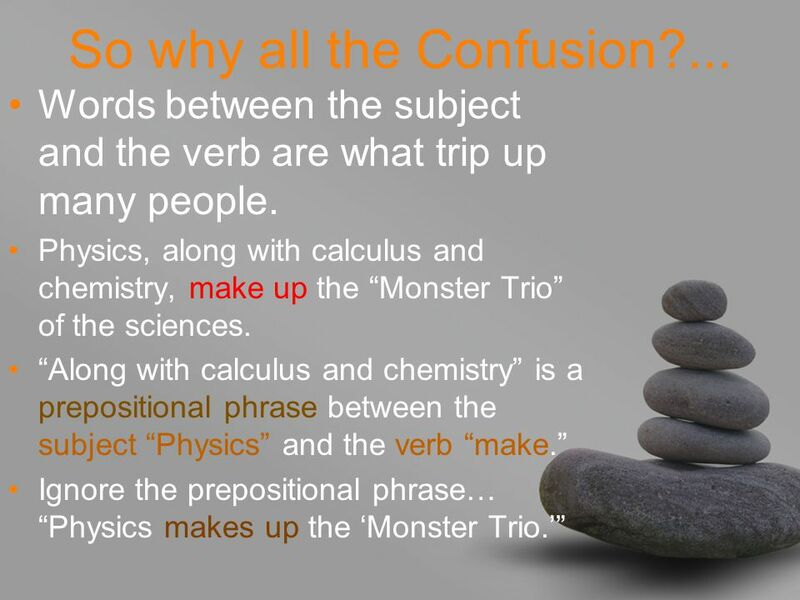 A singular subject takes a singular verb. 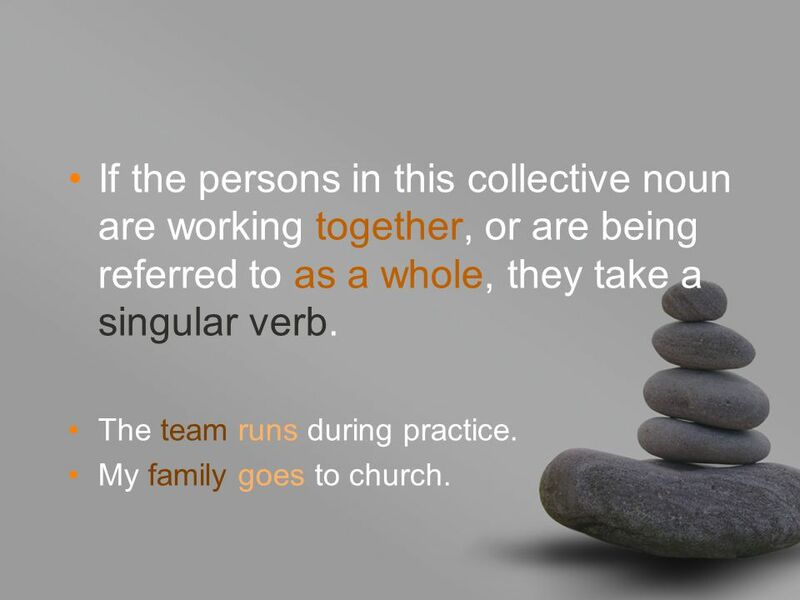 A plural subject takes a plural. 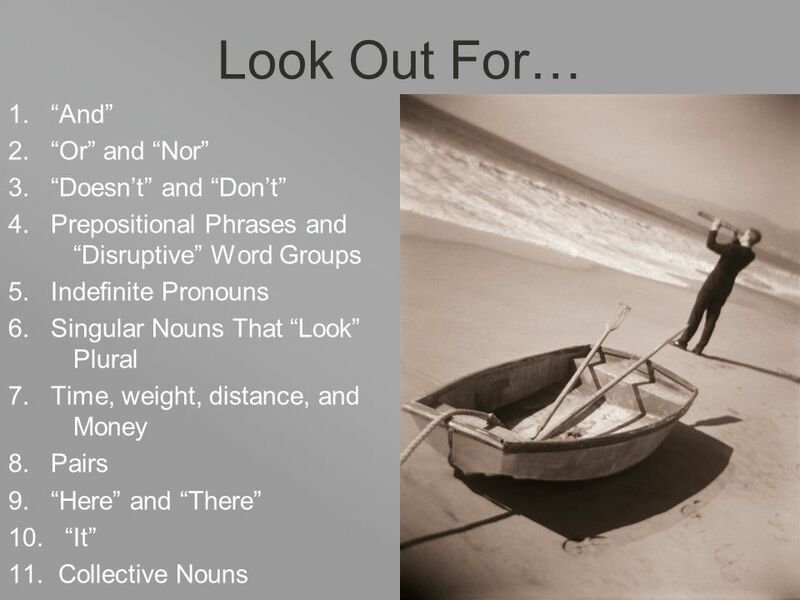 Subject-Verb Agreement -- portions With words that indicate portions—percent, fraction, part, majority, some, all, none, remainder, and so forth —look. Subject Verb Agreement. Nouns name people, places and things. Pronouns replace nouns. Agreement: Singular nouns should have singular pronouns and singular. Let’s Come to an Agreement! Making sure your sentences have subject verb agreement. W HAT IS A S ENTENCE ? Subject||Verb Students||study. Birds||fly. 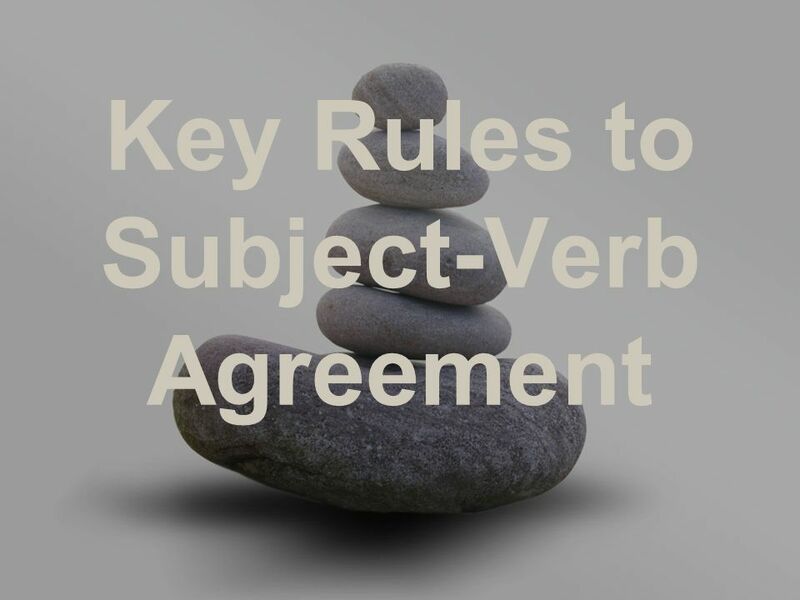 SUBJECT-VERB & PRONOUN AGREEMENT © Capital Community College Welcome to the PowerPoint Presentation on Subject-Verb and pronoun Agreement, the of grammar! 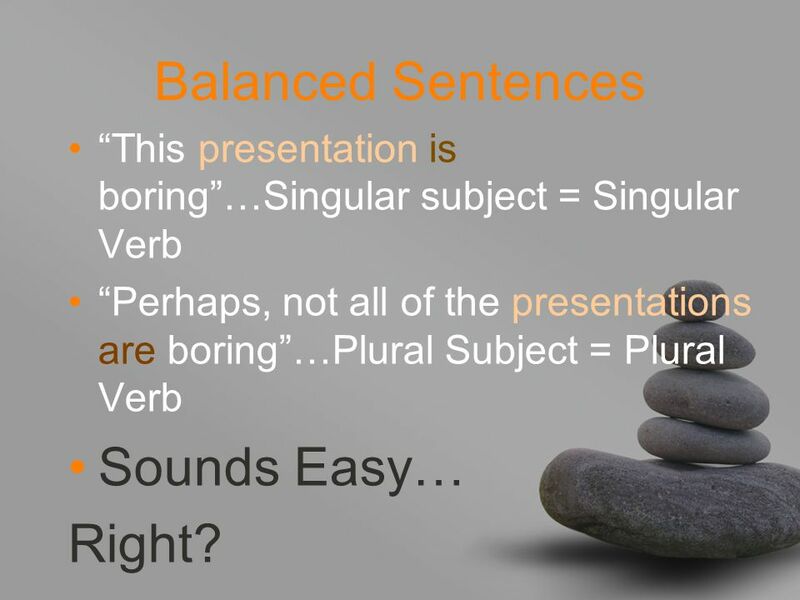 And Subject verb agreement… YOU HAVE TO AGREE! Subject-Verb Agreement By: Garrett Meyer, mahdi mohajerani, Ting Dai, Ho Lun Chung. Reading Exercise Meeting 4 Matakuliah: G0582/Bahasa Inggris 1 Tahun: 2007. 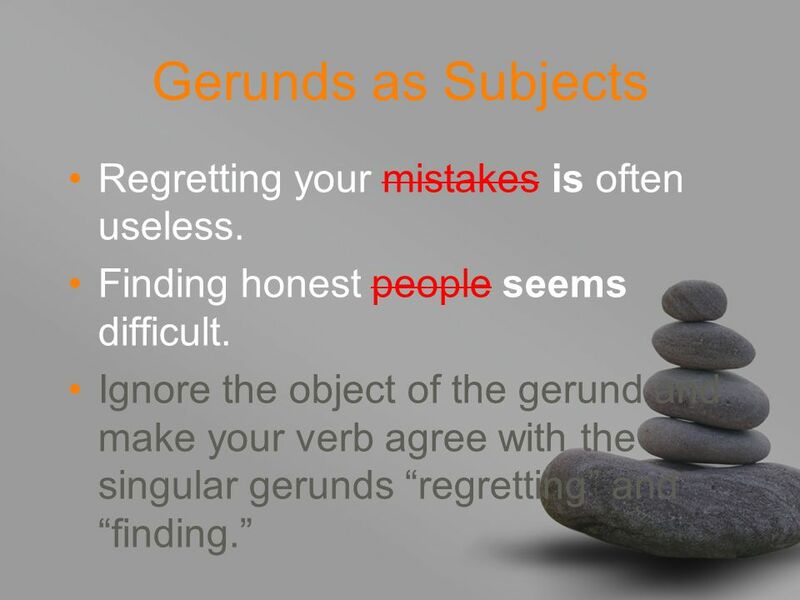 GRAMMAR NOTES: ENGLISH I SUBJECT-VERB AGREEMENT RULES.